If Harold Camping of Family Radio is right, there will be no need for this article for come next Wednesday when the weekly Herald comes out- there will be none of us here to read it! Spring might finally have arrived in Cape May County — but apparently according to some misguided few, the apocalypse will be soon to follow. And all the commotion about such nonsense makes Pastor Rudy just sick to his stomach! One of the reasons for my internal nausea is that it just gives more fodder for those who already make fun of God and it does nothing to deter them from continuing to not take Him or His people seriously. And if there is one thing that I have learned along my journey it is that while Christians have done many a foolish thing that deserve all the ridicule that it receives- God on the other hand is no laughing matter and it saddens me that many will turn their nose up at the One they should be bowing a reverent knee towards. This stupidity will serve as a further obstacle to get people to understand the truth and not too quickly dismiss it as nonsense! Have you seen the waste of money that has been poured into this careless campaign? This country has been bombarded with the literature, the pamphlets, the subway ads, and the billboards that broadcast on the side of the highways that “Judgment Day is coming.” And while there is no doubt in my mind that Scripture clearly teaches that a day of reckoning is in the future of mankind- what makes this latest propaganda wreak more of manure than a message that needs to be heeded and attended to is that a date has been set for May 21, 2011. That’s the day when 89-year-old radio host Harold Camping declares that God’s true believers will be lifted into heaven and saved during a biblical event widely referred to as the Rapture. The problem I have with all of this horrible hoopla is why is any intelligent person paying any attention to this proven false teacher? This is not the first time that this so called biblical expert has led many a gullible person astray. In the early ’90s, Camping published a book entitled “1994?” which claimed that judgment day would arrive in September of that year right around Labor Day weekend. It didn’t! When he was confronted with such a staggering anticlimax — the world, after all kept on spinning — Camping chose not to be discouraged, but to learn from his mistakes. But if ever Camping could have learned a lesson, it should have been in the area of humility. Always a pompous and stubborn man, Harold Camping has been vocally critical of local churches and pastors through the years and even recently announced a few years ago that God had abandoned the church and would now only speak through Camping’s radio ministry. Why any so-called believer wouldn’t run for the nearest exit after that absurd remark is beyond me! But this civil engineer by trade has some kind of strange hold over people. Appearing to be very intellectual and parading as a serious student of the Scriptures, Camping went back to the drawing board and continued to crunch the numbers based upon his own strange version of numerology. 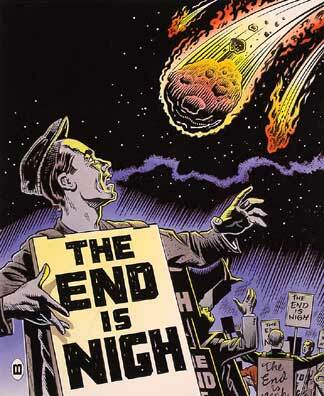 His calculations have led him to believe that May 21, 2011 is the beginning of the end and he has since spread this wacky word through his broadcasting network, Family Radio, and has quickly built up a frenzied fervid following that will once again come up empty! What happens when the world doesn’t end on May 21st? Many will have a good laugh and make fun and move on. As for me, I do believe that Jesus will come back some day. When He ascended into heaven, He did make it very clear to His followers that someday He would return. But He also said these words that too many have allowed to go into one ear and right out the other. Jesus said this about the last days, “No one knows about that day or hour, not even the angels in heaven, nor the Son, but only the Father.” (Matthew 24:36) What part of nobody knows does nobody understand? 1Thessalonians 5:2 also teaches us “for you know very well that the day of the Lord will come like a thief in the night.” What thief calls to tell you the day and the hour and the time he will be visiting your house? The key teaching here is that we should live like everyday could be the end of the world as we know it but because we live by faith- it would all be fine! It will all be fair. It will all be just like He said it would. So maybe we need to get back to the Bible and make sure that the ones we are allowing to teach us the Scriptures are really using God’s words and not their own to make the points. And I would challenge anybody who doesn’t understand what the Bible actually says about the days to come to check out the last book of its contents. It is called Revelation and it actually tells us how this movie is going to wrap up and it does so, so that we would choose to live not in fear but learn to dwell by faith! Be careful to not too quickly dismiss its words because of the words of some misguided crackpots! We are vulnerable to the counterfeits when we don’t know what the real deal looks like! But God did not leave in the dark- so we would not get fooled by false light! I’ll see you Wednesday and my faith will still be in tact because I have my signal dialed to WGOD and when He tells me that it is the end- then I’ll believe it- but not until He says so!